Thanks Muddpuddle. I think that digging into the minds of characters is a lot of fun. Plus, reading this many books in a series that has the same characters almost forces one to dig a bit. Excellent review Brian, this sounds like such a fascinating series and I particularly liked learning more about who the young Voldemont was. As you say, Harry and Lord Voldemont came from similar damaged backgrounds but Voldemont was never able to rise above his childhood and just kept getting worse. Also good point about Harry realizing that there comes a time in life when you are no longer a child and you have to begin steering your own ship so to speak. I'm tempted to read this book first but I am sensing the Harry Potter series should be read in sequence. Thanks Kathy. Rowling doing paint a picture of how Voldemort got worse over time. Harry’s predicament at the end of the book is stark. I would definitely recamend reading the books in order. So much not work if the books were read out of order. Really good review, Brian. 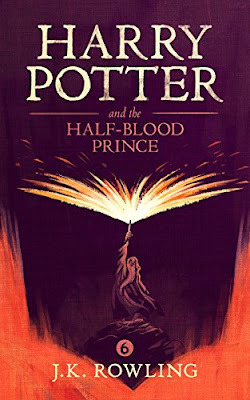 I am reading the Potter books vicariously through you. A couple of interesting points: the concept of malice and psychopathic thinking and also, that someone might become that way, because they were not conceived out of love. Although if that were true, we'd all be in trouble, because surely not everyone in our lineage was conceived for the "right" reasons. Still, I enjoyed your review and since I'll never read the books I thank you for that. Thanks Sharon- I definitely agree. Not being conceived out of love is not a reason for someone to be a bad or malicious person. In fact, that is a very bad idea. I do not think that Rowling was trying to reflect reality with that one. I thought that it was just neat symbolism. I've only read the first HP book (as mentioned before) but this one sounds excellent as well. I enjoyed reading your commentary, as usual. It can really be fun to read books in a series, and it seems that you really are! Hi Suko - I am enjoying thelanguage stages. Faust is considered by many to be Goethe's magnum opus and the greatest work of German literature. The earliest series. I do like reading series too. If you go on with your Harry Potter reading I would recommend going in order. Do the summer days of Harry seem a bit dull compared to the magic wars in the later sections of the book? Hi James - Early on, in the first two books, Harry’s time with his relatives The Dursleys was very interesting. But they have gotten very repetitive by this time. So the magical wars are much more entertaining in the later books. I remember when I first read this, there was much argument about Snape - was he a good guy or a villain? I was in the “good guy” brigade, carefully reading and noting the evidence. There was more evidence in the final book, well before the Pensieve revelations. It’s interesting that the author compares and contrasts Tom Riddle and Harry. Even after all the dreadful things Tom has done, Hogwarts is referred to as the home of the two orphan boys. Someone commented that there is something very much like the Ewells(To skill A Mockingbird) about the Gaunts, with Merope as Mayella Ewell, and I can see that. Reading your review I can only sigh -- Rowling used to write so well, but the movies she's done are...weird. Hi Sue- I have actually finished the last book now. I still find Snape to be a bit morally ambiguous. I may be in the minority however. The Ewal And Gaunt parallel is interesting. I wonder if it was intentional. Hi Stephen - My wife and I were just talking about this. Maybe she just needs to stick to novels. Very well written. I find the similarity between Harry and Voldemort especially unique. Both have similarities that are undeniable, yet one chose goodness, and the other chose malice, much like in real life, in which both the good and the bad exist. I also found the quote especially interesting. Thanks for stopping by and thanks for the good word Alicia. Voldemort seems to be sociopathic by nature. Harry’s personally type also seems natural. Great wrap-up. The Half Blood Prince is my favourite because of all the revealed backstories, mystery on campus, and psychological goings-on. You bring out so many good points, such as the limitations of the education system, and safety concerns about inviting a child like Tom to enroll, who had already displayed his psychotic personality. He was 'inwardly seething as malice' as you say, and the other students didn't deserve to have him unleashed among them. In retrospect, one of the big mistakes made by Hogwarts staff. Makes for a great story though. Hi Paula-You raise a good point thaf Tom should never have been allowed at Hogwarts. In some ways Dumbledore, for all his benevolence, allowed the weak to be bullied by the strong. He also allowed too many to bully Harry this way. Yes, so my kids said. Book 4 picked up the pace again and turned a new, and somewhat darker and more interesting corner? I recently also read this volume of the series. I thought that Dumbledore was regretting having given Tom/Voldemort the benefit of the doubt and trying to make up for that by showing Harry all those scenes from Voldemort's life, giving him an edge Dumbledore thought he might need. Also thought this volume moved from children's literature into YA, with all the romance and snogging. Your review gives me much to think about as I prepare to write mine. Thanks for giving me the incentive to finally finish the series. Hi Judy - Indeed Dumbledore ended up being too trusting here. Here, it seemed that Dumbledore was executing a sort of master plan to prepare Harry. This one did raise it a notch. I look forward to your commentary. Hi WG - I think that this one was a little darker. There has been a gradual trend in that direction throughout the series. Oh dear! I think I clicked on 'create a link' instead of 'post a comment' in which case goodness only knows where my comment might be. Anyway at the risk of repeating my comment. Love your insight into this book. This was a series of books I read as they came out. I keep meaning to re-read them but have never done so. Perhaps now is the time. Hi Tracy - A lot of people read these as they came. A lot of people seem to also reread them. It is such a popular series. I've enjoyed catching up on these recent posts. With the HP series, I've always wondered most about Snape's character, which takes some twists along the way (and in spite of not reading the last two books, I was given spoilers about his fate). It will be interesting to hear what you have to say about him at the end of Book 7. I also enjoyed reading your initial reaction to Russell Blackford's book. I hope you revisit the book on this blog. One of the most disconcerting things I see in talking about U.S. politics is how an ordinarily intelligent person can suddenly revert to nasty remarks or simple soundbites in response to a politician's name or specific stance. It's like I'm suddenly talking to a Facebook post and not a person, in those moments. And yes, there's also the way some people relish getting others fired or harassed at home and work over a poorly worded tweet or a "wrong view." Thanks Hila. Snape is indeed interesting. He really has a lot of awful traits despite choosing to oppose evil. I will be posting about Blackford’s book. Things have gotten out of control. As you mention, the incivilty is terrible. But the social media mobbing, censorship, targeting of employment of people is an affront to decency and freedom. I will have more to say soon. I really liked this one dear Brain! a wonderful commentary ,so enjoyed it! Hi Baili - As the series moves, Harry does become more confident and more sure of himself. Thanks Lainy. I did not know about the names. That is neat. It is also very cool that you got that picture.